You are now entering Sawitta’s world of, QUIK-FIRE. 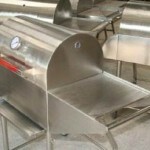 Where things are done the old fashioned way, taking pride in ‘Hand Crafting‘ our beautifully designed Stainless Barbecues, Custom Barbecues, and Stainless Steel Kitchen Equipment. We understand our customers are not invisible entities, but real people who deserve our absolute attention! 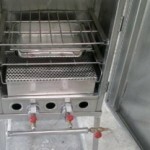 Quik-Fire BBQ’s are fabricated to American Quality Standards, with each barbecue-grill being individually handcrafted, welded not bolted, coming to you as a complete unit ready to use. 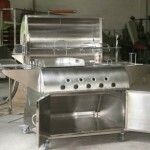 No more struggling with, in our opinion, overpriced imported barbecue grills made somewhere north of Thailand coming to you unassembled in a cardboard box. All you need to do with your new, barbecue-grill is remove the bubble wrap, hook up the gas, or load your Charcoal, and begin to barbeque. Could it be easier, we don’t think so! 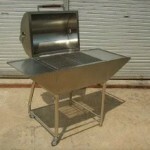 You won’t find paper thin Stainless, Enamel coated Tin, or rust loving Cast Iron, with any one of our Barbecue grills. 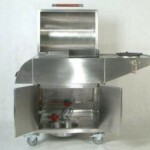 We use quality stainless sheet for the body, fire-box walls, all supporting fire-box interior angle irons, including heavy stainless angle irons over the fire tubes. 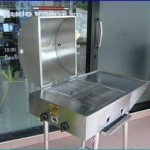 Along with, heavy stainless rods for the barbecue grate to extend the long life you hope for, and expect. hardwood handles are made to roll as you lift the top and let it down. Our wood handles do not get hot. No more burning your hands using the Stainless tube handles found on other barbecues. Our high quality Stainless Products are made to meet the needs of professional chefs, small restaurants, and home owners alike. 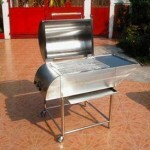 If you desire the best, buy the best, a stainless Barbecue. 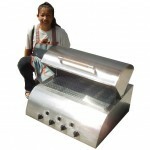 Over and over we hear from potential customers their Thai wives do not want them spending money on a new barbecue. 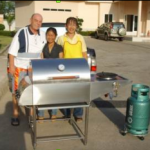 However, once ordered and received, it takes about five minutes for those same Thai wives to fall in love with the family’s new, Quik-Fire BBQ. 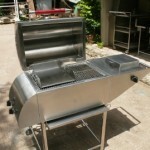 All products are available from our factory in, Udon Thani, Thailand. Bangkok, Phuket, Pattaya, Rayong, Nakhon Ratchasima, Buriram, Chiang Mai, Chiang Rai. We would love to hear from you! Please fill out this form and let us know what you need. This one helps us get back in touch with you. 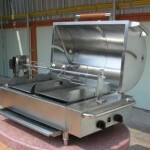 What Quik-Fire BBQ Model(s) Are You Interested In? Quik-Fire "SS Master Deluxe 4n1"
Quik-Fire "SS Crown Counter Top"
Quik-Fire "SS Custom Design BBQ Grill"
Ask away, we're here to help! Barbecue size & Destination dictate the price.